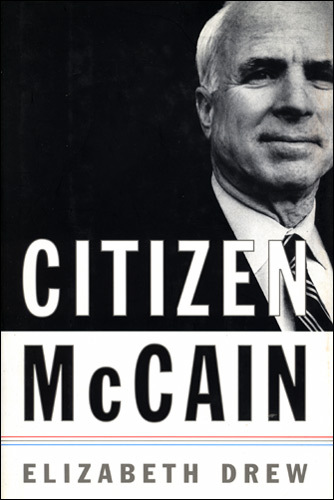 Given unprecedented access to Senator John McCain for a full year, journalist Elizabeth Drew offers a fascinating peek at the man certain to be the 2008 Republican candidate. The year was 2001, and we follow the Senator from his battle for campaign reform to the hours in the aftermath of 9/11 when McCain calmed the nation as Bush dodged around the country on Air Force One. CITIZEN MCCAIN reveals McCains calm and smiling demeanor has a dark, fatalistic side, and at times he explodes for no apparent reason, which led Bush backers to start a whispering campaign that he is unstable. But Drew writes that he also has a kindness, even a "sweetness" to him thats rare in politicians. Impossible to pigeon-hole, McCain has been embraced by progressives, mainstream Democrats, neo-con extremists, and Reagan Republicans at different times of his career. But Drew also shows that he has trouble building coalitions. What kind of president would he be?